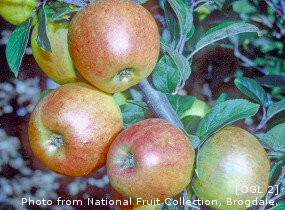 APPLE, KING OF THE PIPPINS (Malus domestica King of the Pippins). Fruit. Dates back to 1770’s. This partially self-fertile variety is firm and juicy with wonderful complex flavour which sweetens with age making a superb dessert apple. Also an excellent flavour when cooked keeping its shape and bright yellow colour so it is good for apple tarts and a good variety for juicing and cider making. Medium sized, green/yellow with a red flush with russet at the base. Kidd's Orange Red Oct-Feb Kingston Black Nov.